Is it use for any remedy? In this document it is stated, that there are differences in the composition of wax from Apis cerana and Apis mellifera. "In Asian beeswaxes, the amounts of C31 and C33 in the pool of free fatty acids are reduced, but C25 hydrocarbons are increased compared to that of A. mellifera. " C31/C33/C25-hydrocarbons are terpenes, and terpenes are know to pheromones in the insect world, also are antiseptic/antimicrobial. Terpenes can be found in resins! So there might be a difference in the resins the bees collect in Asia and Europe. Containing different terpenes - that might affect the mites as pheromones? Just a thought. 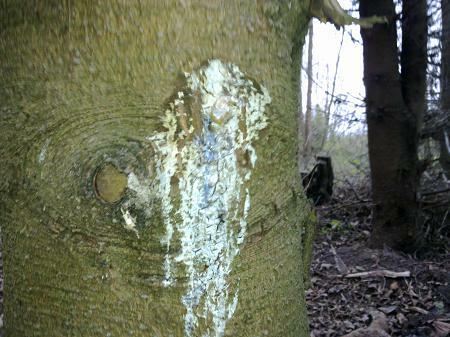 The results indicated that non-tolerant colonies collected more resin than the tolerant ones. The percentage of four biologically active compounds – caffeic acid and pentenyl caffeates – was higher in propolis from tolerant colonies. The results of this study pave the way to understanding the effect of propolis in individual and social immunity of the honeybees. Further studies are needed to clarify the relationship between propolis chemical composition and honeybee colony health. 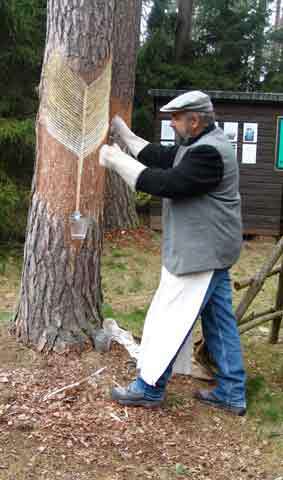 Erik Osterlund wrote in sweden about the importance of bees collecting biodiverse propolis. Different plants have different properties. We simply MUST start seeing bees as part of the Earth Super Organism. That's one thing I've noticed about a lot of pictures of 1st season TBH's on this forum is the difference in propolis build up on hives compared to mine. I'd say mine has more. Oddly, these types of trees are not prevalent in my area. There are some in the town areas that early European settlers planted but it is mostly native gum and acacia. Maybe it's the acacia for my area, they have a tendency to excrete sap. 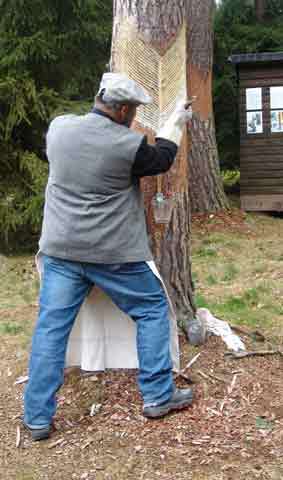 It is one of the many aspects of beeking that has brought me joy to witness, how they use propolis to seal up their hive. Such an wonderful technology. And that is definitely an Official Resin-Collector's Hat. 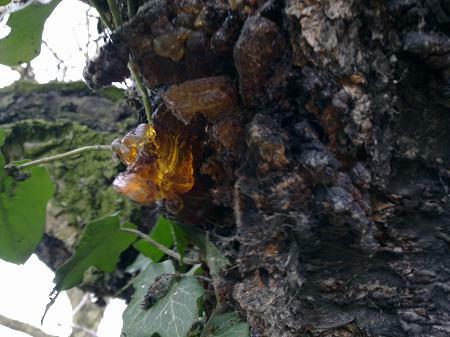 The first resin I found right in front of my house in my garden - at a very old cherry tree. 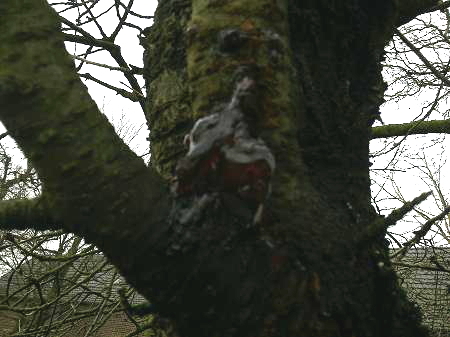 The resin is virtually squeezed out of the tree. 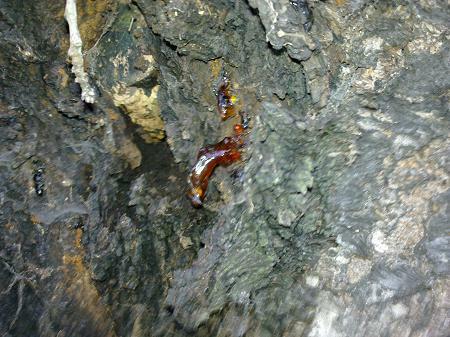 The resin also looked like bark, so you need a closer look to see it. 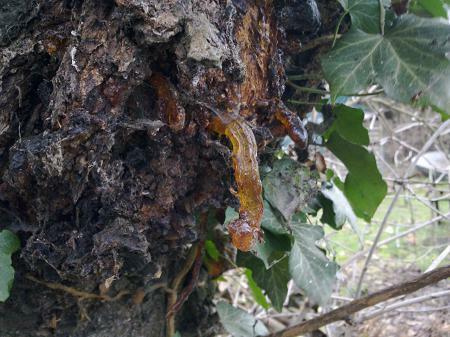 Thick pieces of resin were the twig was harmed by a severe storm. This is just one tree! After ten minutes of collecting resin. That was a bit too easy. The rest of that small container I filled with resins of firs. This resins smells pretty good. Where the twigs are, the trees seem to weep. Even without a wound. Next time I go for the poplar trees and pine trees in my area. This was pretty easy to collect - the container shown was full at the end of the day. I will mix this with just a little olive oil and molten bees wax later to make a paint for the inside of the new hive bodies. Also I intend to use for swarm traps. I enjoyed looking at the pictures of the museum and the collecting of resin. The tree they are taking the resin from looks looks like some sort of pinus. I will be looking through my book on plant resins with much more interest now. On the sources of plant exudates in propolis. Poplar bud exudates, together with varying amounts of wax and sugar added by the bees. Horse chesnut bud exudates and various species of conifer have their own compositions which are very different from those of poplar. Lot of information on composition and plant origins from work at Oxford by Greenaway et al. A paper in Apidologie 33 (2002) 41-50 The varroacidal action of propolis: a laboratory assay Garedew et al. is worth looking at. Also in JAR Vol. 49 (3) pp. 257-264 Evaluation of the toxicity of a propolis extract on Varroa destructor (Acari: Varroidae) and Apis mellifera (Hymenoptera: Apidae). Damiani et al. "The effects of a propolis extract on Varroa destructor and Apis mellifera were evaluated by three different application methods: topical, spraying and oral. 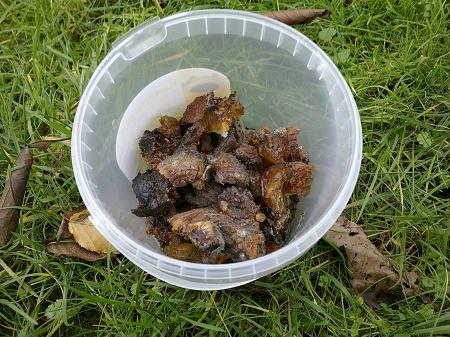 A propolis sample was extracted and its organoleptic and physic-chemically traits characterized. These analyses showed that it was a typical propolis from the Pampean region in Argentina, with elevated contents of biologically active compounds. Topical application was carried out by subjecting mites to contact with various propolis concentrations for different periods of time, which resulted in mortality and narcosis. Acaricidal effects were stronger with increasing concentrations of the propolis extracts. Spraying infested bees with a 10% propolis solution was harmless for bees but killed 78% of mites. Feeding infested bees with propolis extract in sugar syrup was not toxic to the mites but caused the death of bees treated with the highest concentration. Our results suggest that the propolis extracts from the Pampean Region could be incorporated into bee colonies by spraying, although the appropriate doses and concentrations to be administered, and the mechanism of action of the extracts on the mites are still to be elucidated." Please take note: "Appropriate doses and concentration are still to be elucidated." 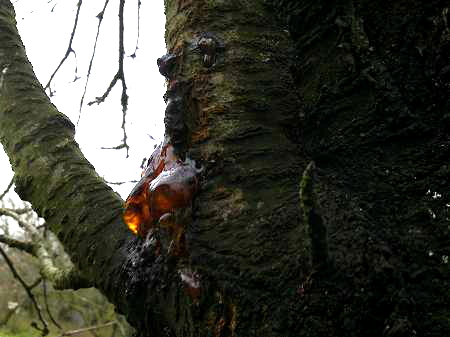 We have a sitka spruce that exudes quite a lot of resin and is about 10m from the hive, so quite a good source for the bees for resin collection. 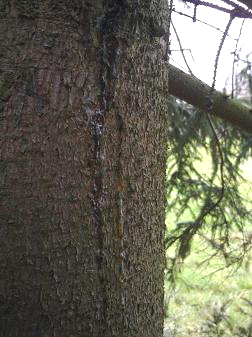 "Bleeding" resin in this tree species is sometimes an indication of drought stress. "From secretory epidermal cells of the leaf buds, for instance in poplars, the secreted material is first eliminated into a space between the outer walls of the palisade cells and the cuticle covering them, forming a blister. Later the cuticle bursts and the secreted material collects between the leaves and stipules of the bud. Glandular trichomes (hairs) of species of Alnus secrete a substance containing flavonoid aglycones, terpenes and mucilage". Plants have many chemical defences that act as repellents for use as defence mechanisms against herbivory. 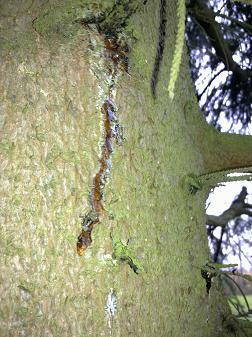 What about scarring firs, pines or poplars to collect fresh resin, dissolve it in honey and stir in some molten wax? To produce some sort of propolis you can use to paint the hive with or to use it like grease patties? Does anyone know how the plants produce the resins? Anyone knows how to stimulate propolis buildup in hives? Thanks to both. The more widely we cast our nets the better the likely catch! the usual plethotra of chemical interventions and other methods. The bees may have an in house (hive) solution that certainly needs more consideration. It has been discussed previously on the forum but I find this paper to be offering (to quote the authors) "the applicability for propolis as treatment against bee pathogens and diseases." 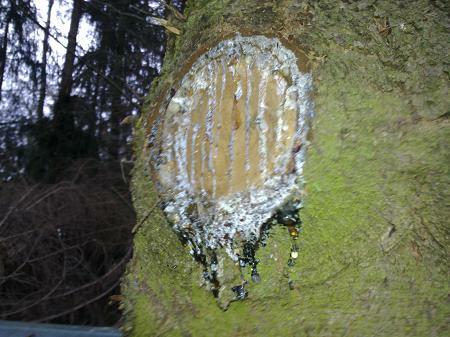 of resin use by honey bees.